Cultivating a love of reading in children is one of our life goals, both as parents and educators. This can be quite challenging with the community we work with. Many children on the autism spectrum prefer to read only non-fiction books and the children with learning disabilities spend more energy avoiding reading than enjoying a book. The Wayside School series offer a gateway to enjoying books. Each chapter could be it’s own short story so the book seems less intimidating to reluctant readers. Add in a dose of humor, a dash of rebelliousness and a whole load of silly and the children are soon eager to devour more. 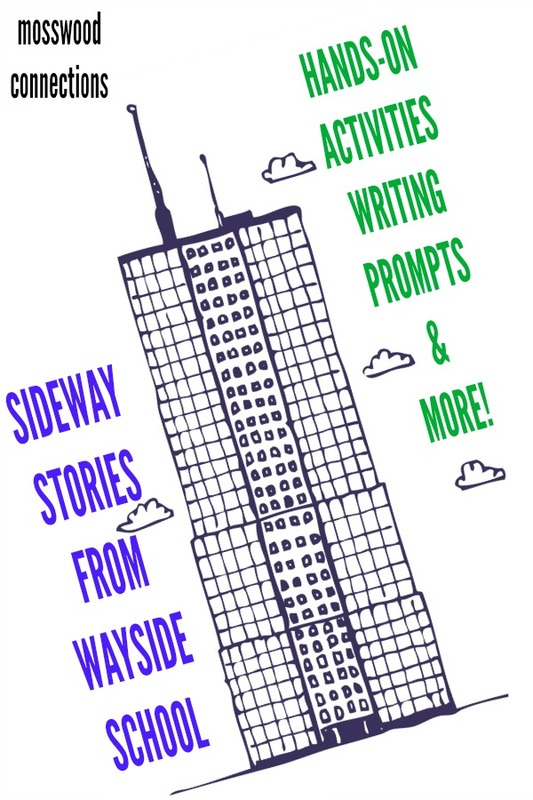 To entice the children further, we like to help books come alive with extension activities so we created a Sideways Stories from Wayside School Literature Unit. Sideways Stories from Wayside School by Louis Sacher is made up of thirty tales (one for each student and teacher who work on the thirtieth story, as well as one each for the cafeteria lady and Louis the yard teacher) and a brief introduction. With each story, the characters leave reality behind and enter a world where people who sleep in the class learn more than those who do not, dead rats walk into classrooms wearing raincoats (and talking), little girls try to sell their toes and a bite in the arm with missing teeth hurts a lot. Everyone adheres to the literal translation of conversations, but things somehow make sense and the people follow appropriate paths and have good (if slightly skewed) morals. 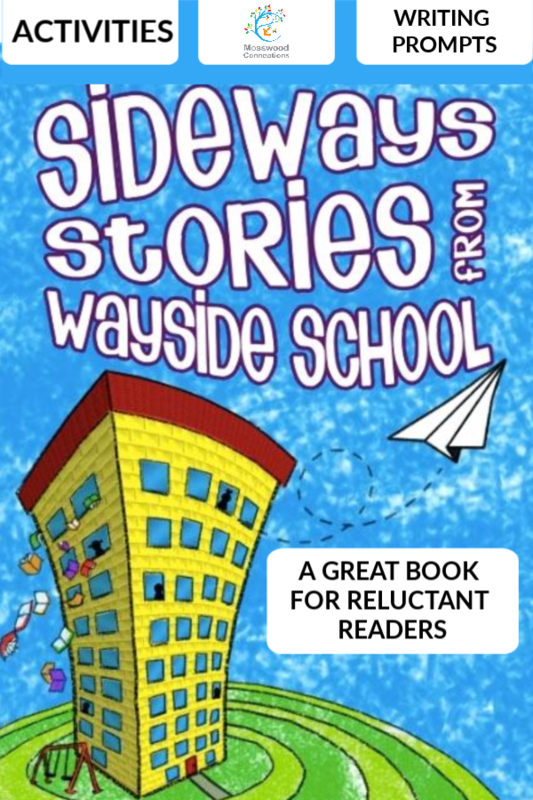 Sideways Stories from Wayside School is rated at Guided Reading Level P, Lexile® Measure 460L, DRA Level 38 and recommended for grades 2- 4. In the first chapter, Mrs. Gorf turns the students into apples because she is one of the meanest teachers ever. Have the kids make an apple doll. Design your own school, you can use these instructions from Crayola. Mrs. Jewls makes ice cream for everyone, with one of each flavor named after the children themselves. The flavors of the students lead to be a problem. Have the kids make freezer bag ice cream and give their ice cream unique names. Benjamin tries to tell the class his real name, but his attempts are drowned out by the class during Music day. Create your own instrument using found objects. How Wee Learn has 42 Splendidly Creative homemade instruments. Give your instrument a made-up name and then perform a song for your class. Download our Sideways Stories from Wayside School Curriculum Guide for vocabulary, comprehension questions and list of standards. Write about what you think makes a bad teacher and what you think makes a good teacher. Think about something that most teachers would not let you do in class, make up a way or a reason for how it could make you a better student. If you could be really fast at one thing, what would it be and why? Write about what you would do as your job if you were class president. would you use to help the students learn? Why? Make up a plan to get Jason out of his seat and why that would work. Make up a plan on how you would get to recess early to get the green ball. Write about your reasons for being happy. If there was a 19th story and a Miss Zarves, write about what she and what her classroom would be like. Write about a time when you met someone who did not like anyone. What did you do? Is it more important to you to play for fun or play to win? Why? Write about your nickname and how you got it. If you do not have a nickname, write about a nickname you wish you had and why. Write about a time when you were right and a teacher was wrong. What happened? Did the teacher listen to you? Write about a time you missed out on something fun because you had to do something else. Write about what you would do if you came to school and no one was there. Come up with a creative plan you would do if you forgot your lunch at home. Write about what the best Halloween party would be like. Include lots of details. Write a story that you think Louis would tell the Wayside School students about your classroom. After reading the book, the students can watch the movie. Have them compare and contrast the book to the movie. Which one did they like better? Why?